News From The 2017 American Academy of Micropigmentation! The Permanent Cosmetic Studio and Lash Lounge Artist’s Carmella Schultz and Kristina Alibrando attended the 2017 American Academy of Micropigmentation Convention at the Gaylord Palms Convention Center in Florida in May. The American Academy of Micropigmentation (AAM) is a prestigious education organization for permanent cosmetic professionals globally. Achieving membership of this organization is the highest recognized credential in the Permanent Cosmetic Industry. Carmella Schultz has been a fellow member since 2000 and a Certified Permanent Cosmetic Specialist (CPCP) with the Society of Permanent Cosmetic Professionals (SPCP). Kristina Alibrando, SPCP, achieved membership with the AAM in 2016. Among the many new, exciting advancements and certifications in the industry, Carmella and Kristina are absolutely elated about achieving their newest certification on ombre brows (combination of brush strokes (microblading) and shading techniques (powder fill) incorporating the use of a digital machine to create a soft makeup look). Desired by women with thinning brow hair, or previously over-plucked brows. 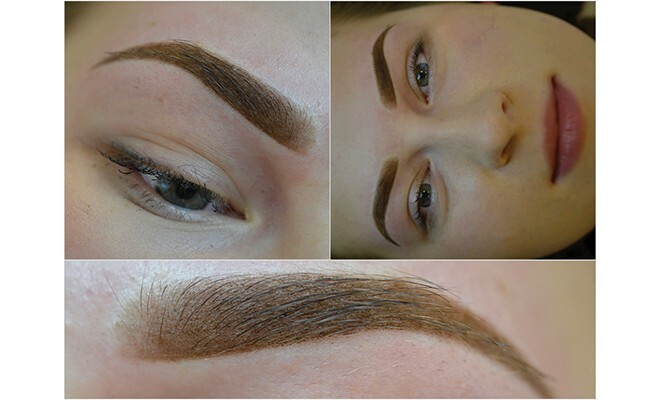 Ombre brows will typically last longer than microblading. We’re also so in love with our new line of ORGANIC Lip Colors! We want every woman to know she never has to wear lipstick again. We can’t wait to share all of our new knowledge with our clients, both new and our loyal clients from as old as 1999! ← Previous Story Trendy Vs. Traditional?